Livingtraditionally Wheatgrass is a 100% organic nutrient-dense alkaline superfood. A valuable source of naturally occurring phytonutrients, chlorophyll, live enzymes and bioavailable vitamins and minerals. It has extremely high concentrations of easily digestible nutrients, fat burning compounds, proteins & amino acids, essential vitamins/minerals and over 90+ trace elements to protect and support your body. 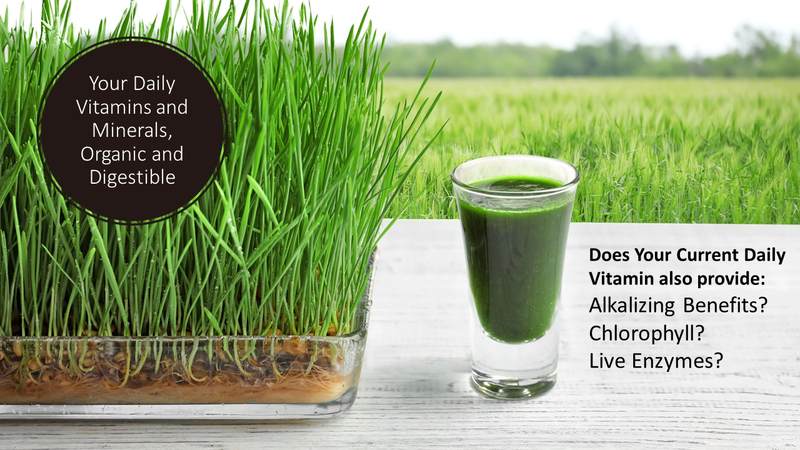 For this reason, Wheatgrass is a ideal daily multi-vitamin for everyone! 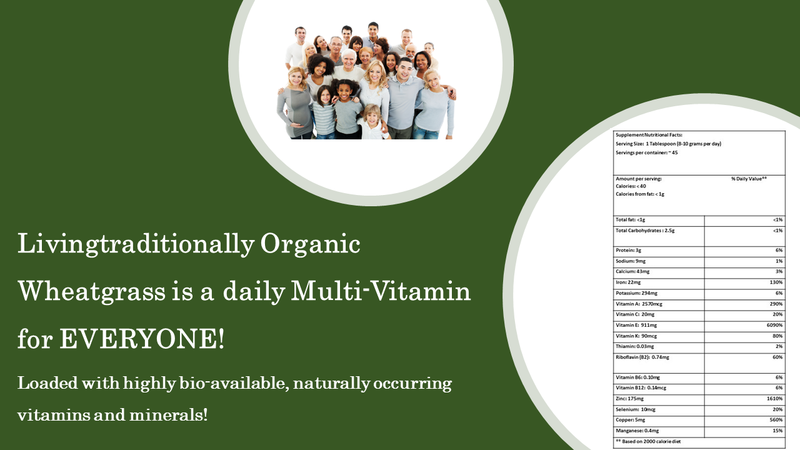 Only this multi-vitamin is 100% natural vitamins and minerals (no man-made or synthetic ingredients and/or vitamins) with the added benefit of chlorophyll and live enzymes! Can your current multi-vitamin say that? In just 30 Seconds a Day, You Can Supercharge Your Life, Enjoy Good Health and Feel Younger! Provides nutrients and minerals to support your body's systems and encourages weight-loss. Taking 2 ounces of wheat grass is equivalent to 4 pounds of green vegetables. Flavonoids and Phenolic Acid make Wheat Grass A strong blood cleanser that to helps flush out toxins and unwanted oxidants. Feel incredible energy and better focus - boost your brain power while energizing your body! Increases Oxygen levels in blood and brain! Stimulates the production of antibodies and promotes a healthy response to allergens and diseases. Glowing, healthier, younger looking skin, hair and nails. Repairs damaged cells and encourages new cellular growth. Balances hormones to reduce frustrations and stress. Also reduces and even reverses grey hair. It's only been about a week so I can't tell yet. Mixing it with orange juice and it taste pretty good. Would like to add more comments later. I like it! I just put it in a small jar, add water, shake it up and chug it. I wish I had found out about this Wheat Grass Powder years ago! This product is amazing! I have so much more energy after using this product, and I feel terrific! I take it every day, either by adding a tablespoon to my protein shake, or by adding a tablespoon to a glass of water. The taste is nice - I had imagined that it would be unpleasant, so I was very pleasantly surprised to discover that it is easy to ingest. My husband is also now a huge fan of this Wheat Grass, and he adds it to his protein shakes daily. I cannot say enough great things about this product - it has helped to keep my skin clear and glowing, is great for the gut, gives me that extra "boost" during my workouts, helps with my autoimmune issues, boosts my mood, etc. I could go on and on! I recommend this for anyone looking to improve their health. A truly amazing product! I love adding this into my smoothies. Total peace of mind . Phenomenal product! Love it in my smoothies and the benefits it provides my body! For a girl who hates vegetables, this is liquid gold!